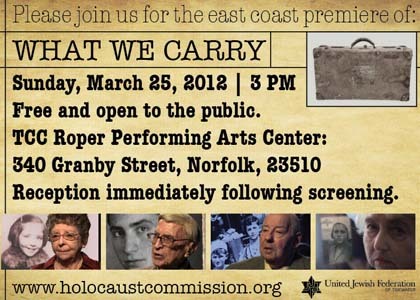 Tidewater Community College hosts the East Coast premiere of “What We Carry,” a documentary featuring the stories of four Hampton Roads Holocaust survivors. The film will be shown at the Roper Performing Arts Center on Sunday, March 25, at 3 p.m. The 63-minute presentation consists of four individual mini-films, 15-18 minutes long, with Jewish survivors narrating their personal stories during World War II. Produced by award-winning filmmakers Janice Engel and Amber Howell, What We Carry combines interviews (conducted locally and filmed in the TCC studios in downtown Norfolk in 2010) with still photos, archival footage and music created specifically for the film. The Holocaust Commission of the United Jewish Federation of Tidewater created the What We Carry project, which also consists of optional interactive elements, to let these survivors continue telling their stories in a way that wasn’t fictionalized or minimized. Two of the four survivors featured in the documentary, David Katz and Hanns Loewenbach, died in January. The other two, Dana Cohen and Kitty Saks, plan to attend the premiere. 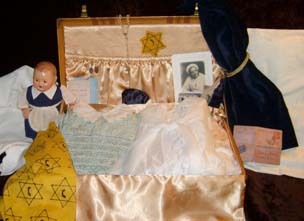 To find out more about the What We Carry project, which, when presented in an educational setting, includes a suitcase containing reproductions of significant items mentioned in the film and a docent-led presentation, visit http://jewishva.org/holocaust-what-we-carry.